Welcome to Moose Hollow MH809! If you want a vacation in one of the world's best outdoor destinations with some of the most breathtaking views in the west, you'll love staying at Moose Hollow 809! Boasting a large master suite bedrooms with private bathroom, private balcony, and great proximity to outdoor adventures, MH809 is the perfect place to relax during your next vacation. Main Level: Kitchen, living room with TV, bedroom, full bathroom, and balcony. Upstairs: Master suite bedroom with private bathroom, and laundry room. Bedroom 1: 1 Queen bedroom with shared hallway full bathroom. 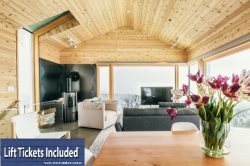 We are truly excited and honored to share our homes with each and every guest and we invite you to stay with us at Powder Mountain Getaways - MH809!